Our approach to business – Creating Shared Value – has always taken the long-term view. CSV brings business and society together, creating sustainable economic value that also produces wider benefits for society. Our efforts for individuals and families, for our communities and for the planet are supported through 41 public commitments, most of which feature specific objectives to 2020. In turn, these commitments will enable us to meet our ambitions for 2030 in line with the timescale of the Sustainable Development Goals (SDGs). Essential to achieving our goals is a robust approach to sustainability, human rights and compliance. Water, to address an issue of critical concern for the planet and a lynchpin of food security. We will evolve and strengthen our approach to CSV, ensuring that it continues to inform all our behaviours, policies and actions. We will also continue to prioritise key areas where value creation can be maximised for the benefit of shareholders and society, and report transparently on our progress. Our progress can also be tracked by our rankings in leading indices. A long-term approach to business has always been part of Nestlé’s DNA. Through CSV, we integrate sustainable development into business activities. This is increasingly important to long-term investors. CSV brings business and society together by generating economic value in a way that also produces value for society. Foods and beverages with a nutrition, health and wellness dimension perform better. Rural development programmes for farmers offer commercial differentiation to consumers, while responsible stewardship of water reduces costs and secures supplies for our businesses. Nestlé is one of a small number of corporations involved in the Embankment Project for Inclusive Capitalism which aims to encourage and measure long-term value creation. Creating Shared Value is important in that it supports the long-term health of the company. With its emphasis on both shareholders and society, the CSV approach to business helps us define which products and services are in line with the expectations of society. CSV generates economic value in a way that also produces value for society. Foods and beverages with a nutrition, health and wellness dimension perform better. Rural development programmes for farmers offer commercial differentiation to the consumer, while responsible stewardship of water reduces costs and secures supplies for our businesses. Our forward-looking materiality analysis helps us anticipate consumer trends including potential legal challenges and ensures we continue to meet consumer expectations of sustainable behaviour. 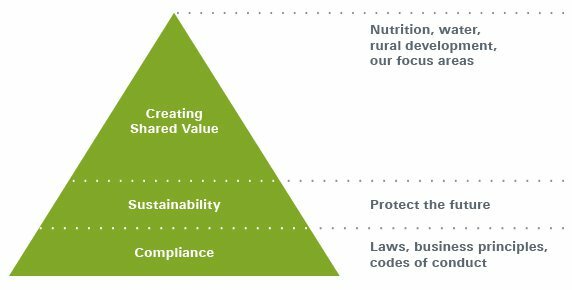 The latest matrix shows that issues such as over- and under-nutrition, water and responsible marketing are central to the delivery of our business strategy, while climate change and human rights are vital for our business success.